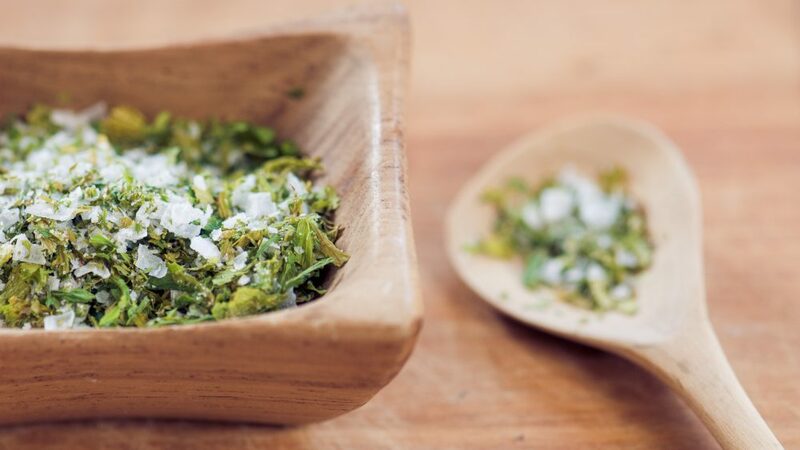 Tried celery salt before? No? Either way, this delicious flavoured salt can be easily bought from a supermarket – or you could make it yourself from the comforts of your kitchen with easily available ingredients. It’s tasty. Try it before you knock it. But more importantly, it’s also a key element in many recipes, including some traditional takes on cocktails like the Bloody Mary and the Caesar. It’s rumoured to be an ingredient in KFC’s closely guarded secret spice mix (x). And it’s also a common seasoning for American-style hotdogs, salads, coleslaws and stews. It’s also commonly used in meat rubs before a roast to give it more of a flavour profile. Give it a whirl and let us know if you’ve found or have any great uses for this underappreciated seasoning! 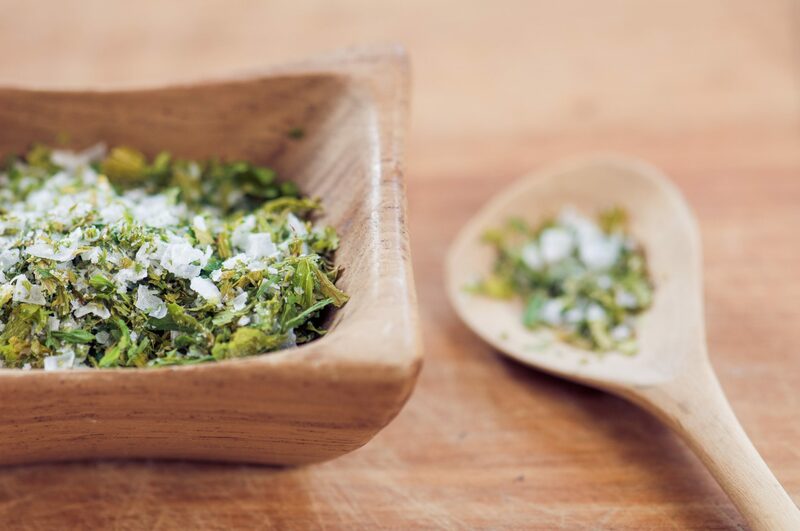 Traditionally, celery salt is made with celery seeds, but we prefer celery leaves: it’s a great way to use up leftover leaves from one of our celery bunches. Whether to use table salt or sea salt is also up to you. Wait, I don’t get it. Sea salt or table salt? We can see how this gets confusing. After all, all salt, even table salt, is sodium chloride, and it all comes from the sea. Table salt’s usually mined from salt deposits: what’s left from areas that used to have seawater but are now dried and gone. The stuff that’s mined is washed with water to dissolve it, then evaporated in vacuum to form salt crystals. It’s then processed to remove impurities, and mixed with anti-caking substances. Table salt is usually 98% sodium chloride and 2% anti-caking stuff. Sea salt, on the other hand, is from existing bodies of seawater, either by solar evaporation (which gives you the more expensive sea salts) or by vacuum evaporation. It’s usually sold unrefined or refined. Unrefined sea salt will contain impurities like algae, other minerals and marine bacteria. Refined sea salt is purified and becomes like table salt, albeit usually flakier in texture. It’s not, despite what some celebrity chefs might like to tell you, actually better for you–salt is still salt, and should be used sparingly. Arrange clean celery leaves on baking sheet in a single layer. Cook for 7-10 mins until dried (but not browned). Be sure to keep checking in on them just in case. Break out a mortar and pestle. Grind salt and dried leaves together until combined. Bang it all into an airtight container. Profit!